To attach a file that contains medical images or software through the cloud, please follow the below tutorial. The are many cloud services such as Dropbox, Google Drive, One Drive, etc. 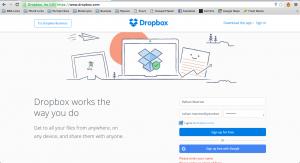 For this tutorial, we will however leverage Dropbox since the mechanism to use the cloud is very simple. 1. Visit the Dropbox page and create an account, or if you already have an account, log into your account. 2. 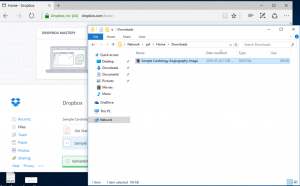 After you have created an account, and have downloaded Dropbox’s desktop application, we will be using the web based console to log in and share cloud links. 3. After logging into your cloud account, open File Explorer for Windows or Finder for Mac, and drag and drop your medical attachment into cloud folder on your browser. 4. After uploading your file to your cloud storage, click a share option. For other applications such as Google Drive or One Drive, you may need to right click the items to see the Share options. 5. Once the Share option has been clicked, a link will be created by the cloud application. To ensure the link is viewable by the doctor and there are no unforseen restrictions from the doctor point of view, ensure that the permissions for link is set so to Anyone with the link can see it option. 6. Right-click the link and copy the link to your clipboard. 7. Go to YourDoctors.Online case, and past the link in the Past Link Here text box. 9. Once saved, you have successfully uploaded a cloud file to your case making it really easy for the doctor to view your information. As a reminder, please do not change the permissions, or edit the link until the completion of the case, as you may accidentally make your cloud file inaccessible by your consulting doctor.